The above info came from atomofish, and was edited by yours truly (contact me). The image came from TV Tome. 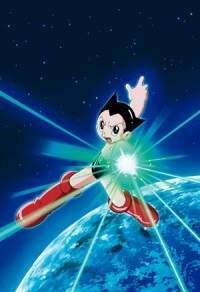 A 2003 version of Astro Boy was created to celebrate Astro Boy's birth and the 40th Anniversary of the original 1963 series. In a future where technology has advanced to its peak and robots serve all of humanity, robot scientist Dr. Tenma created a powerful robot modeled after his deceased son Tobio. However, Tenma mysteriously disappears and abandons his creation. The robot is eventually found, and by a kindly Robot Ministry scientist named Dr. O'Shay. Reborn and given a new life as under the name Astro Boy, he quickly learns about life and the world around him. Astro is given "Kokoro," which makes him stand out from most robots by enabling him to have emotions and learn and grow just like any human being. Realizing his true goal to bring peace to both humans and robots, he uses his special powers and abilities to bring peaceful solutions to human and robot conflicts. However, his mysterious past and origins catch up with him, and Dr. Tenma returns with sinister purposes for his creation. Soon, Astro Boy is caught in a struggle between humanity and robot kind, and he will soon discover his destiny to ultimately bring peace to a world where humanity and robots move closer everyday to a violent confrontation. What are Tenma's true motives? And will humans and robots ever be able to coexist in peace?